Want to know how you can keep your feet happy? Way too many of us are taking our feet for granted, until of course, they start hurting. You don’t have to be a runner to experience sore feet, maybe you are just on your feet all day, or maybe you work in an office and are experiencing swollen feet, whoever you are, whatever you do, when sore feet strike, you realise how much you rely on them. 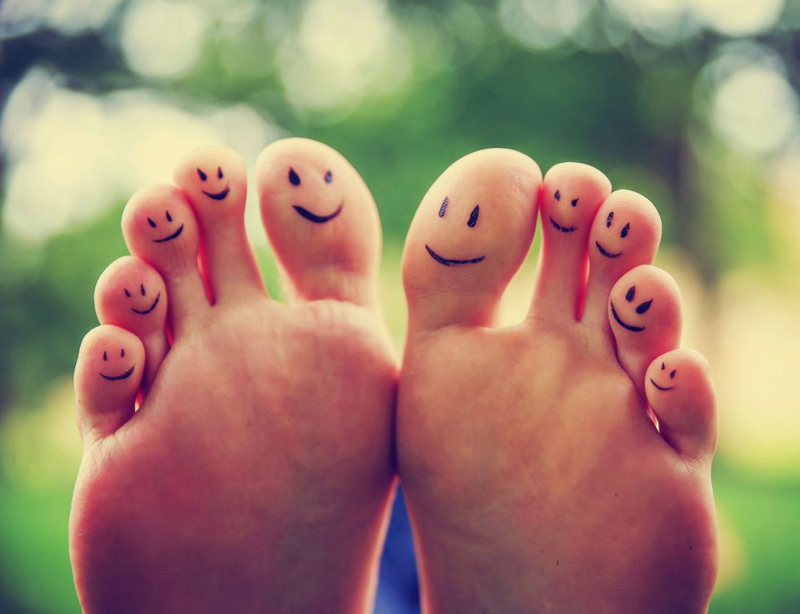 I’m going to give you five super simple tips to keep your feet happy! Yep, my first tip is the classic, make sure you have the right shoe for you. Slipping on sandals or thongs in summer is way too easy, and a nice looking pair of boots aren’t so bad in the winter, right? But before you start wearing them every day, make sure you know what foot type you are, and what shoe is best for you. My second tip is grabbing a tennis ball. If you are at work or on the lounge watching TV do five minutes of foot yoga! Roll your feet over a tennis ball, it will both give your feet a nice stretch and help you to loosen the tight muscles. If you are an office worker, stand up every 30 minutes to stretch, go for a walk around the office or the block then sit back down at your desk, this allows your feet to get the circulation going again. If you are on your feet all day, try to sit down every 30 minutes, grab a water and breathe. We all need to be pampered every now and again, sitting down after a hard day or a hard week and soaking your feet will not only relieve aching but it also helps with calluses and dry and flaking feet. Have you been suffering from foot pain for a while? It is always best to get an expert’s opinion so we can help you recover quicker. So there you have it, if you are suffering from foot pain, or someone you know is please don’t hesitate to give the clinic a call on Newport 9997 4970 or Balgowlah 9949 3770 and we can help you out so you can keep your feet happy!